A very authentic group home, both in construction and in terms of decor, with modern amenities such as a sauna, that is what you can expect here. In many details, the atmosphere from yesterday is present, such as in the old countertops which are no longer in use. At the long table the whole party can eat together, but that is possible as well outside on the large, south facing terrace. When you descend the garden you reach the pond below the house and a bit further runs a stream with small waterfalls. The garden is all around the house and so you can always look for either the sun or the shades. In bad weather there is enough comfort within the house to spend whole days. And what about the luxury that every bedroom has its own bathroom! 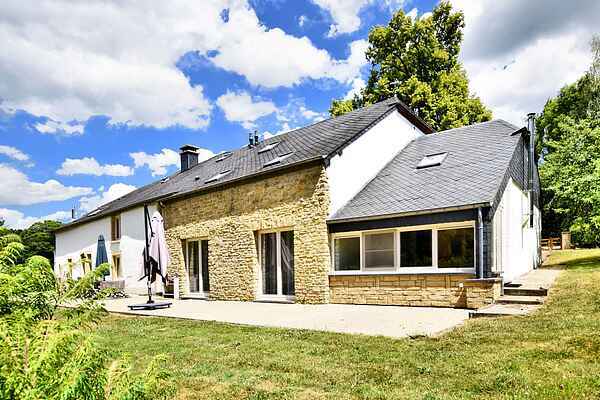 Located only 200 meters from the Semois, this is an ideal starting point for hiking, biking, kayaking, rafting and skiing. There are many picturesque villages, as well as the Trappist Abbey of Orval and the town of Bouillon. Luxembourg and northern France are within easy reach.